Senior Sammy Arredondo is this year’s Media Chief for The Apple Leaf. 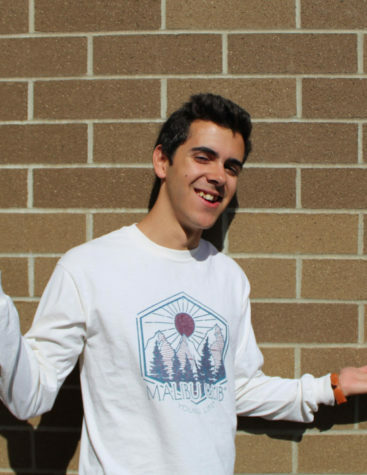 Although this is his first year actually being on staff, Sammy was involved in The Apple Leaf last year by DJ’ing “the most litty dance of the year” in hopes of helping his now team member, Mason, get The Apple Leaf out of debt. In addition to Apple Leaf, Sammy is the trumpet section leader in the Golden Apple Band and is involved with Honor Society, Model United Nations and Young Life. Sammy is happy that you are reading this - as it proves that his job has meaning - and will now shamelessly invite you to follow The Apple Leaf on Facebook, Instagram and Twitter so you never miss another Kurt quote again. Sammy is super excited about this upcoming year and can’t wait to see how long he lasts without accidentally deleting this website from the internet (which has happened once so far! ).